The hamstrings include three separate muscles that work together: the semitendinosus, the semimembranous, and the biceps femoris. 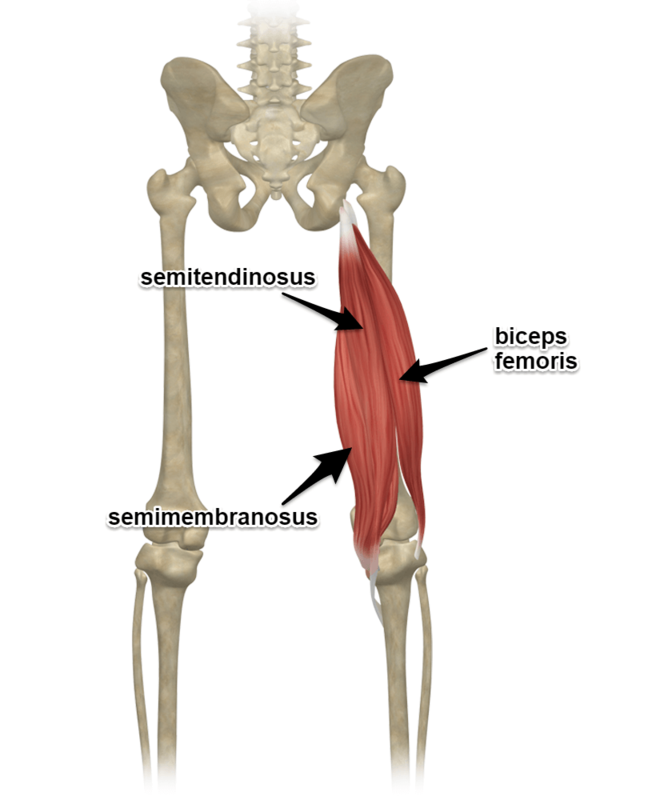 Semitendinosus: semi means half and tendinosus means tightly stretched band (otherwise known as a tendon). This muscle is about half tendinous. Semimembranosus: semi means half and membranosus means skin. The name of this muscle name refers to the sheath like tendon of this muscle. 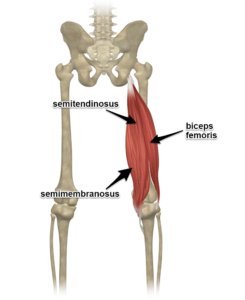 Biceps femoris: The name refers to the fact that this muscle has two (bi) portions. It has a short head and a long head. Short Head – bottom part of the femur next to a raised line called the linea aspera. Hip extension – All portions except the short head of the biceps femoris. You can read more about how the hamstrings contribute to movement at the knee joint (page 93, 1st ed.) and the hip joint (pages 109-110, 1st ed.) in my book, Functional Anatomy of Yoga. Hamstring Strain: What is it? When any one of the three hamstring muscles is stretched beyond its limit, hamstring strain can occur. Hamstring strains tend to be either the result of sudden stopping and starting during a sport, sprinting for example, or extreme stretching as might occur in gymnastics, dance, or yoga. 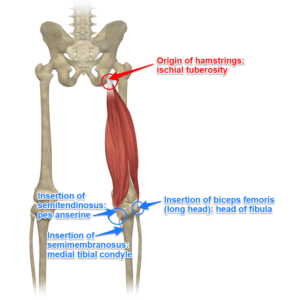 Hamstring strains from sudden stopping and starting tend to occur in the long head of the biceps femoris near its distal attachment, while stretch related hamstring strains tend to occur near the proximal attachment of the hamstrings at the top of the thigh. Returning to sports or other activities that are demanding of the hamstrings before a hamstring injury has full healed will also increase chances of a recurring hamstring injury. There are three grades of hamstring strain. Grade 1 strains include milder strains that can be treated at home. Grade 2 strains are more severe and include more loss of range of motion. Severe grade 3 strains may include avulsion, where some part of the muscle actually detaches from its connection to bone. Generally, symptoms include a sudden sharp pain in the back of the thigh during exercise, when walking, or when bending over. It may be accompanied by a snapping feeling. Grade 1 – Some tenderness or indication of sudden pain in a point at the back of the thigh. Grade 1 made only cause slight pain or a sensation of tenderness in the thigh. Grade 2 – Sudden sharp pain at the back of the thigh. There may be some bruising and/or swelling. There will likely also be some loss of range of motion. Treatment can range from home treatment to surgery depending on the severity of the hamstring strain. You should always consult a physician for recommendations on treatment. Mild strains can be treated at home, but if there is severe pain and/or an inability to bear weight on the injured leg, an X-ray will be needed to look for an avulsion and an ultrasound or MRI will be needed to show severe muscle tears. For more severe (grade 2 or 3) strains, your health care provider may recommend physical therapy exercises to help regain strength and mobility of the hamstrings. For the most severe strains (grade 3), surgery may be required. 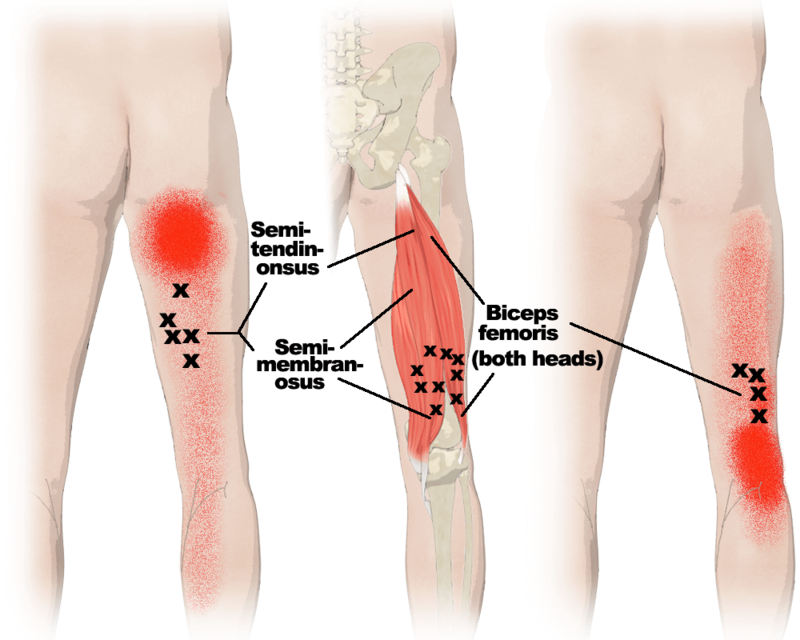 Hamstring tendonitis is most commonly caused by over-use of the hamstring muscles. 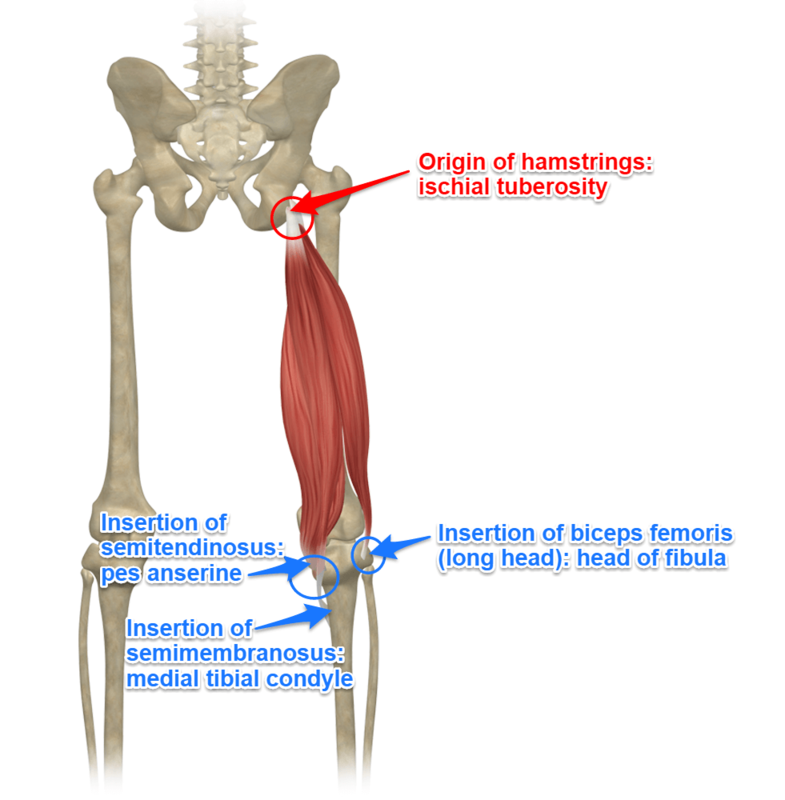 Depending on the activity that has been repeated enough to cause the tendonitis, soreness, tenderness, and/or inflammation may be felt either toward the proximal end of the hamstrings at the ischial tuberosity or toward the distal end of the hamstrings at the back of the knee. You might be familiar with this sensation as sit bone pain. Treatment generally includes rest, ice, and anti-inflammatory medications initially. It then can include bodywork, stretching, and strengthening exercises to restore strength and range of motion to the muscles. See a physician in order to determine the best course of treatment for your case. Keep in mind that trigger points can create pain at or near the sit bone. There are two very popular articles on the website here and here that also show the images of trigger points that refer into the hamstrings. This is nit-picking, but do you think utkatasana is really a good example of hamstring contraction? I realize that, generally, when the knee flexes the hamstring muscles are contracting to cause that action, but would you agree that the knee flexion is more of a passive action mediated by an eccentric contraction of the quadriceps muscles rather than a concentric contraction of the hamstrings in utkatasana? We don’t mind nit-picking or corrections. You are right in your observation of the knee joint, however, the hamstring cross the hip joint and extend it. Therefore their eccentric (if we’re moving) contraction, or better still isometric (no movement) contraction is stabilizing the hip joint. How does that sit with you (pun intended)? Very true regarding the action at the hip in utkatasana. I guess what I was pointing out was that in the “hamstring stretch” examples, you used very obvious examples of hamstring stretch ( hip flexion paired with knee extension), so I expected to see an equally obvious example of hamstring contraction (like, urdhva dhanurasana). Because, if we are being technical, the hamstrings are isometrically contracting in the “hamstring stretch” poses as well. I totally get and love that the majority of yoga poses exhibit both contraction and stretch at the same time, but, for educational purposes, more obvious examples of stretch (without contraction) and contraction (without stretch) might make more clear what joint actions (performed in a certain relationship to gravity) stretch/contract the muscles in question. I think the simple answer is for me to add a comment under each image. I usually do to be honest, but rushed this one. I’ll add it to my list of things to do. Oversimplifying anatomy, not good. Complicating anatomy, also not good. What to do? Your feedback and nit-picking are good for us all. First, I will always associate you with hamstring injuries … only because you helped me heal mine!! And second, I think you should be mighty proud of me in that I totally get the isometric contraction of the hamstring in utkatasana (as well as the warriors too!) – but a year ago? Not at all aware of anything but quads! HA! The doctor who created the RICE method in the 70s has retracted his statements in light of updated studies and data. You’re not supposed to ice or take anti-inflammatory medications. I heard that, too. RICE is still used for acute injury but in situations of tendinitis or tendinopathy, research has found that ice and NSAIDS aren’t effective. Shay… Can you please link to your references for everyone’s benefit? This meta-analysis that I linked goes through a lot of difference modalities used to address what they are now terming tendinopathy, but what I feel is the big take-away is that the research is showing that in overuse injuries, there is little to no inflammation (except in hands, apparently). 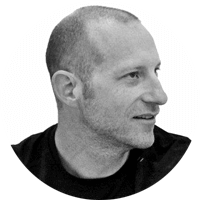 The majority of disfunction and pain arises from structural shifts to the tendon’s micro and macro-physiology. The article doesn’t directly address RICE as being ineffective, but, as RICE’s main objective is to minimize inflammation, it may be fair to say its use should be questioned. As for NSAIDS, there appears to be a short term relief of pain, but no long term benefits. According to the literature, if you’ve been experiencing overuse pain for longer than two weeks, NSAIDS aren’t going to help. here’s the explanation of why RICE delays recovery, as written by the Doc who coined the term. I assume you did read to the end, right? Not that this should be applied to long – term care but even the suggestion of RICE in the article above is for an INITIAL home treatment. That seems to be in line with his recommendations. I disagree that your recommendation is totally in alignment with recent recommendations. The compression and elevation aspect of the RICE model is still proves effective at reducing acute inflammation and so, yes, that aspect of your recommendation aligns with recent suggestions. However, you recommended, in your article, to, “ice the injured area for 15-20 minutes a few times daily.” That suggests prolonged use. That time and duration is not supported by recent data. The recommendation given my Dr. Mirkin is to, immediately after an injury has occurred, apply ice for 10 minutes, remove ice for 20 minutes and then reapply ice for 10 minutes – no application of ice six hours after acute injury as no benefits have been found and prolonged use can inhibit healing. You also recommended, “anti-inflammatory medication such as ibuprofen or acetaminophen.” Dr. Mirkin addressed the use of these medications and the recent data that indicates their benefits are marginal and short-term. In the section where you discuss treatment for tendinitis, you also suggest, “rest, ice, and anti-inflammatory medications, initially.” Not one of those are supported by recent data outlined in the pubmed tendinopathy meta-analysis I linked. The data shows there is minimal to no inflammation present in situations of overuse injury (tendinitis/tendinopathy are examples of overuse ). Ice and anti-inflammatory medications have been shown to present little to no benefit, except for short-term pain relief, in situations of overuse injury and can actually cause harm by through cell death (from over-exposure to ice) and/or incurring the side effects of regular NSAID use. Additionally, eccentric strengthening and stretching movements, not rest, are recommended treatment. During my time studying for athletic training (those people who run out on the field to assist an injured athlete), they were following similar recommendations to the ones your voicing – it just seems that the science and data are starting to suggest otherwise. Thank you for your feedback, The post has now been updated with a recommendation of seeing a physician. I am looking into latest research the ice and anti-inflammatory meds. Another hamstring strain risk factor: hamstrings that are too loose. I speak as a hypermobiile person with extreme amounts of hip flexion. It’s very difficult to keep the sitbone tendons free of tendonitis. Thirty years ago, I pulled a large section of the left one right off the sitbone. It was a very loud bang and a very long recovery process. I’ve had a couple of requests to write about causes of inflammation in practice. I’ll include you and your pop in it if possible! As ever, thanks for your awesome work. How convenient that I found this article now! Thanks for the article. Very interesting. What about very short hamstrings scenario? I practice yoga for the past 12 months and still cant forward bend from the hip. 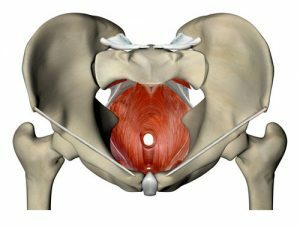 My pelvis just won’t rotate forward. 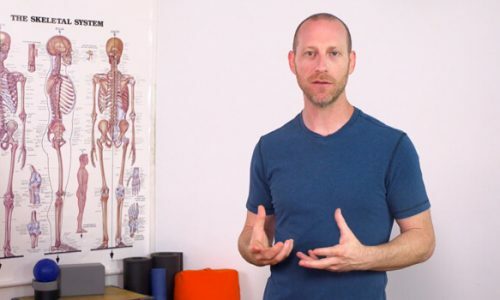 I had major low back problems for the past 20 years, including a slip disk, and the more I read about it, i correlate the short hamstrings with the back issues. Even with daily hamstrings stretches, they “refuse” to lengthen and to allow me to properly bend. Did you find an effective way to address this scenario? Similar to AY, my hamstrings are so tight my legs are virtually Z shaped in forward fold. Part of this stems from weight training in my younger years. But now I am 55 and have been basically sitting at a desk staring at computer monitors for 20 years like a lot of men in my age group. Two years of yoga has brought incredible benefit to many aspects of my live, but my hamstrings are still like steel bridge cables! I found your website and after reading I have started keeping my legs straight during practice. This leaves my back at a 90 degree angle (pretty much) to my legs. Interestingly the pain in my sit bones is now gone since straightening my legs. So what is the path towards more supple and flexible hamstrings for someone with such limited range?